This organ was built for a music room which already has a chamber organ in 17th century style, made by Goetze & Gwynn in 2006. It is intended for 18th century repertoire, not specifically English but within the limits of the instrument. 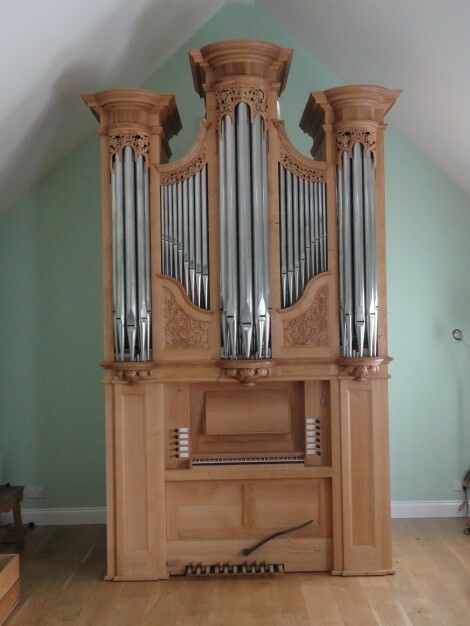 It is based on the organs made by Thomas Parker for Great Packington ex Charles Jennens of Gopsall Hall Leicestershire (1750s) and St Mary Leatherhead ex Watford (1766). The pipe scale is chamber organ scale, six pipes smaller than ‘church scale’ but the mechanism is designed as for a miniature church organ, with a complete rollerboard. The Open Diapason uses the chamber organ scale + 2 pipes. The Principal and Fifteenth use the chamber organ scale. The Mixture uses the chamber organ scale – 2 pipes. The Cornet uses the chamber scale + 5 pipes. The stopped ranks also use the chamber organ scale + 2 pipes (the circumference of the wooden pipes and the plate width of the metal pipes are the same). The 4ft helpers are a dulciana scale, chamber organ scale – 5 pipes. The voicing is based on the 1776 chamber organ by John England at Wardour Castle.